Every mother of a brave soldier faces that moment where she wonders if she had a choice in designing her offspring, would she have constructed such a military one? Then we wonder where did this intrinsic desire to push a body as far as it can go, to constantly train for battle, to discipline self unceasingly, come from? Nevertheless, we would not trade this child for another and our conclusions can only lead us to the Creator of our child’s story. The Lord has arranged for my son to be on his twelfth deployment, sending him again to Afghanistan. 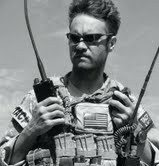 He is a Master Sergeant serving as a Joint Terminal Attack Controller (JTAC) in a Tactical Air Control Party (TACP). This is a very small, elite component of the Air Force that has a significant assignment to execute in recent wars. He endured intense training, both physical and educational, to prepare for coordinating ordinance drops and to provide precision attack guidance. Big words that mean his small team (two or three) is on the ground with Army infantry at the front of the battle to maintain contact with air support and control attack aircraft when the troops are engaged by enemy forces. Hands trained for war. Fingers for battle. Before each deployment, we seem to end up having the same conversation; the one where I am trying to encourage him, but where he is the one who ends up encouraging me. He reminds me that he is just as safe in whatever far corner of the world he is being deployed to as he is at home, because he is ready. G.K. Chesterton said that, “Courage is almost a contradiction in terms. It means a strong desire to live taking the form of readiness to die.” My soldier says he is ready. He is ready to push relentlessly for the protection of his comrades. He is ready to lay down his life for his family and friends. He is ready to be a part of what keeps his country free. He is ready for whatever plot twist the Lord writes into his story. So how does a mother of this kind of soldier pray? I pray the Soldiers Psalm (Psalm 91)…that because this soldier dwells in the shelter of the Most High, he will live in the shadow of the Almighty…that the Lord will be his refuge and his fortress…that the Lord’s faithfulness will be his shield and bulwark. There are soldiers out there who are saying, “Don’t worry America, we’ve got your back”. Have you considered praying, so that you can reply, “Don’t worry Soldier Heroes, we’ve got YOUR back”? This entry was posted in PeoplePosts and tagged Afghanistan, Christianity, inspiration, JTAC, military heroes, praying for our soldiers, protecting our freedom, TACP, United States Armed Forces. Bookmark the permalink. So very honored are we that you shared this mother’s prayer for her soldier son, Luke, with us here. Praying for Luke and his cohorts RIGHT NOW! Thank you so much for posting this. It has touched my heart and reminded me to pray for those in our military. Psalm 91 is a very good place to start! I lovingly read this with tears in my eyes. Such a passionate young man who is the product of a love filled family where family is an example of support, compassion and perserverance. Blessings on them all we pray. I come from a family of veterans and I’m totally with you on this one…great post! Thanks for touching this Marine Mom’s heart! Wow! What a wonderful and beautiful post. You said it so well and I really appreciated this one. We have several family members that have served and are serving to protect our freedom. You are so right in us encouraging our soldiers by affirming them we have their backs through prayer. Also, holding their dear families in prayer as they are separated due to deployment. Thank you for the opportunity to share this prayer request. Abiding fully means praying much, and praying much enables abiding fully! I am in great need of both. To bring a prayer need to The Family is not just humbling, but also a source of accountability. Thank you. Blessings to each. Thank you to your beloved son, and to you for your sacrifice as well!